About a year ago, I got to visit the nearest BJ’s Wholesale for the first time. I discovered a plethora of name brand items that aren’t available in many other wholesale retailers (such as Glad bags…my favorite!) BJ’s Wholesale is also a great place to stock up on small appliances, such as this Babycakes Cupcake Maker that I reviewed. 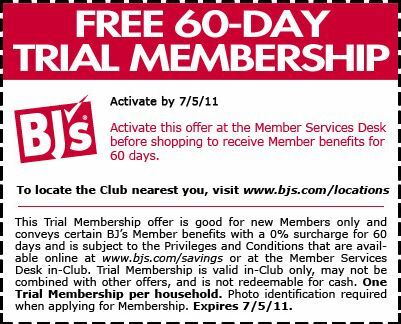 If either of those tempted you, but you still aren’t sure if you want to take the plunge into a full-on membership, now’s the perfect time to give BJ’s a try. Simply visit the BJ’s Wholesale Club fan page on Facebook, “Like” them, and then click on the “Free Trial Membership” tab. You’ll be able to print out a coupon for a free 60-day trial membership. Thanks for the share. I’m following from the Purex Insiders. Come visit me back!